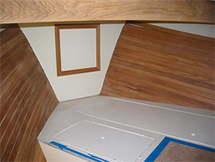 Building a new boat from the keel up is an exhilarating experience. 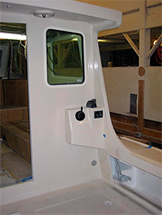 It's a collaborative effort between designer, builder and owner that culminates in the birth of a beautiful, new boat. It doesn't get much better than that! As you can see in the photo to the right, launch day is a momentous and joyous occasion that marks the end of the building process and the beginning of a lifetime of enjoyment on the water. 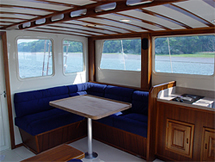 At Six River Marine, we have expertise in most wooden boat building techniques including traditional plank on frame and lapstrake as well as modern methods like cold-molding. 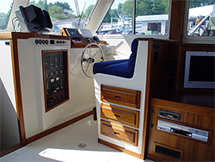 We can also apply our years of experience in systems design and integration, fine joinery and other disciplines to finish out new fiberglass hulls. 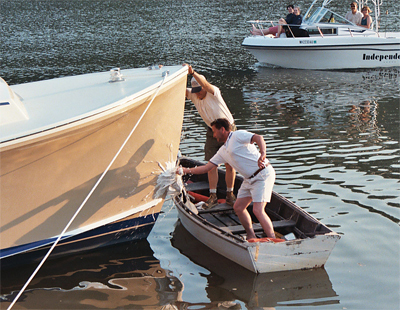 Whether you're looking to build a 10' yacht tender, one of our Harbor Island Series boats or West Pointer's , a sailing vessel from a classic design or want to elegantly finish out that new sport fishing boat you've been dreaming about, we welcome the opportunity to speak with you about your new construction project and help make your boating dreams become a reality. 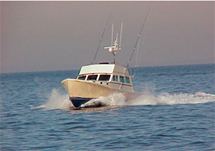 Project profile: "KING CHARLES III"
KING CHARLES III is a 42' custom sportfish that came to us as a bare hull (42' Wesmac) with an extended sport top. 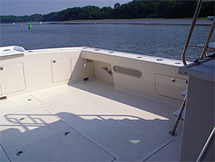 The owner wanted a fast, quiet and easily maintained vessel to take him to offshore fishing grounds, and he had many custom features in mind. 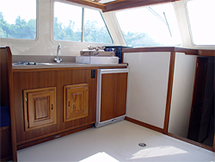 These included a 100 gallon livewell and a 500 gallon ice hold below deck in the cockpit, sinker storage bins and another baitwell below the washrails. 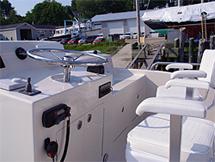 He wanted a third helm station in the cockpit for maneuvering the boat while fishing and also required a flybridge with a helm situated for viewing the action in the cockpit. Additionally, an interior was needed that slept and fed six in comfort and style. 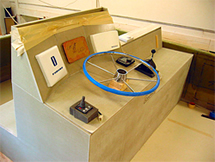 We achieved a 24 knot top speed through a combination of factors. First, the Wesmac hull is inherently fast and came powered with an 800 hp Caterpillar diesel. 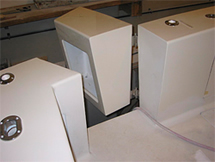 Then, we kept the boat as light as possible by using foam core composites for all structural components. 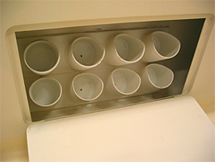 We kept things quiet by employing a variety of methods. The engine room was completely lined with 4" of sound dampening insulation. Even air intakes were baffled and lined with insulation. 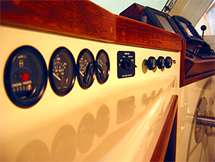 We isolated engine vibration by "soft mounting" the cockpit and salon decks as well as the stateroom sole. Finally, we installed an underwater exhaust system which is not only quiet but has the added advantage of virtually ridding the cockpit of unwanted fumes. The success of these methods is evidenced by the fact that the crew can carry on normal conversation at cruising speed. 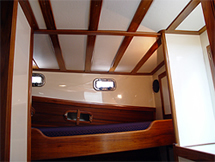 We kept maintenance painless by creating smooth gelcoated surfaces with radiused corners throughout the vessel and we saved all the woodwork for the interior where its presence adds a sense of comfort, elegance and style. 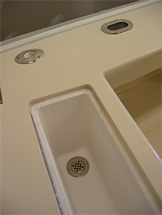 The photo's below show some of the construction details and end results of this beautiful boat. Click on the images below for larger photo's.